Cut tofu into 1″ cubes, fry on each side in non-stick skillet until browned. Meanwhile make salad dressing: combine soy sauce, vinegar, chili oil, sesame oil, fish sauce, garlic, chilis and honey in bowl. Add olive oil in slow stream while whisking to form an emulsion. Refrigerate until salad is ready. Set pot of water to boil on stove, once at a rolling boil, add noodles and cook until tender, usually 4 – 5 minutes. Drain noodles and rinse under cold water. Set aside until vegetables are ready. Heat non-stick skillet on medium and add a tablespoon olive oil to pan. Add tomatoes and cook until almost at the “blistered” stage. Add peas, onions and carrots, tossing together, just blanching them. 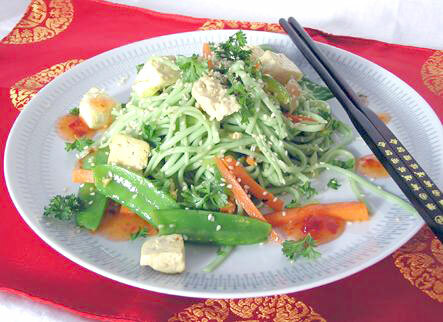 Toss veggies with noodles and add cold dressing, toss with cooked tofu pieces. Plate with a topping of toasted sesame seeds and small drops of sweet chili sauce.